Cette cabine est incroyable. Situé sur la rivière Weber. C'est une cabane en rondins personnalisée qui peut accueillir 20 personnes. Il dispose d'un grand espace de réunion pouvant accueillir 23 personnes. Il est idéal pour des vacances en famille ou une retraite d'entreprise ou même un week-end. Il dispose d'un grand feu de camp et deux belvédères de plein air. Il ya un patio avec des sièges et un barbecue. Il est un peu moins de 3 miles dans le canyon de sorte qu'il a accès toute l'année. Il y a 4 télévisions, wifi, et le service sans fil aussi. Maître est à l'étage principal avec une salle de bains principale, et une chambre semi-privée au large du maître. Deux autres chambres sont à l'étage avec une salle de bain complète et une table de billard. Au-dessus du garage pour trois voitures se trouve un grand espace avec une salle de bains, un espace de télévision, 2 lits queen et 4 lits jumeaux. Our family had an excellent time together at this property. Close enough to ski in Park City, about a 30min drive but easy to get back and forth. Our family loves to play games together in the evening after a day of skiing. And this property is excellent for that. It has a very large family gathering area with several tables to support family meals and setup board games in the evening. The cabin is ideally setup for three families with children; (three different bedroom areas). So this worked well with having two married children. Our kids expecially liked having the billiards table at night. The cabin is situated in a scenic canyon. I imagine it is very nice in the summer as well. Everyone enjoyed the beauty of a large log cabin. We appreciated that it is a stand alone house and not a connected town house. Our kids are good but can still get loud at night playing games. So it was nice to not worry about disturbing the neighbors. The kitchen worked very well for serving the extended family and great to have the laundry in house. All in all a very successful family gathering. My family will have great memories of our week there. Highly recommended. We had a great time at this lovely cabin. The pool table was a great hit with our grandchildren. The owner was great to work with and was willing to make things right with the few problems we encountered. Everyone was wishing that they had gotten the bedroom over the garage. And our grandkids loved taking bubble baths in the jetted tub. Not exactly what I expected. 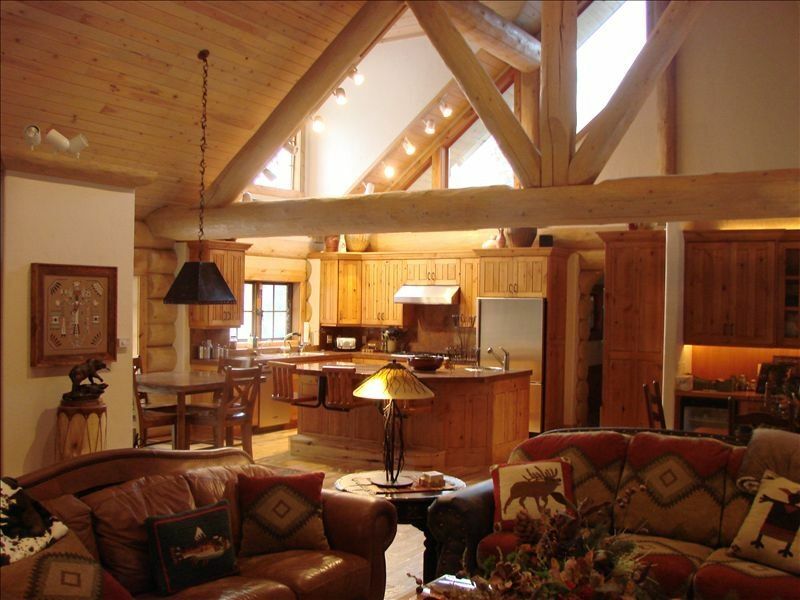 The photos would indicate that it’s a luxury log home and at one time it was. However, it is in desperate need for $150,000 worth of renovation. The pluses are that it sleeps several families and if you have a bunch of young kids that you are worried might tear up things, you have no worries. It’s already broken. Another positive is that it’s right on the Weber River. It’s beautiful but it needs a much better pathway to get to it. Winters should be fun here if you can rent a snowmobile. Lots of area to do so in the mountains. Be careful, a lot of the hand rails are broken. Also, there is essentially no air conditioning. If you stay during the summer, you will suffer until it cools down at night. No coffee maker either. They need a new house cleaner also. We had to rewash the bed linens and dishes before we used them. They do have WiFi though! If you have an extremely large family or need a place for a frat weekend, this is your place. Much cheaper than Park City if you don’t mind a 40 minute drive. This cabin was perfect for our family reunion. Everyone loved it. There was plenty of room for all of our activities, inside and out. The atmosphere was wonderful and the property overall had everything we needed. There were minor issues when we initially got there, but they were resolved with the owner right away. The cabin was beautiful and really did add to everyone’s enjoyment of the reunion. It was a critical component of the reunion’s success. This cabin is incredible! The setting is serene and one of the prettiest home sites in the valley. Even during a snow storm, the access was perfect. There are no dirt roads, and all highways were plowed. When we arrived, the road from the highway to the house had even been cleared. From the moment we crossed the bridge toward the cabin, we knew we had found a special place. Everyone remarked about the comfortable beds- something so hard to find in a rental property. We had a magical weekend and hope to find another opportunity to return. We had a great time and Julie was so helpful and accommodating. We would love to come back again and again. A great find! Holiday Rates vary. Please call for Pricing. $550.00 per night on weekends. $500.00 per night on weekdays. 2 night min and does not include cleaning fee and sales tax.